Good morning … Today is going to be a doozy. Take a moment now, before it gets too crazy, to center yourself. Do whatever works best for you. Maybe it's yoga. Maybe it's meditation. Maybe it's watching an endless loop of a seal slapping a guy in the face with an octopus. Whatever you need. Once you’ve done that, don’t forget to RSVP for tomorrow’s Axios event on global competition in a 5G world. My colleague Bob Herman takes a detailed look this morning at a particularly opaque part of the health care system: How consultants help employers choose a pharmacy benefit manager — and whether they steer their clients in the right direction. How it works: Employers pay consultants, who are supposed to act as disinterested third parties, to help them pick a PBM. Consulting firms solicit bids from PBMs, compare their prices and pharmacy networks, and then present the options to employers. The biggest PBMs rely on the “spread pricing” model, while smaller competitors more often use a “pass-through” model. Employers often end up choosing spread pricing contracts, enticed by big rebate checks and lower fees, even though a pass-through contract might save them more money in the long run. "Everyone in my role is frustrated with the PBM space," says the top benefits executive at an employer covering more than 10,000 U.S. workers and dependents, who asked not to be named to speak candidly. The other side: Consulting firms say they don't recommend one type of PBM over another. "Our clients look to us to help them to disassemble the complexity," says Carmelina Rivera, a pharmacy consultant at Willis Towers Watson. She adds her firm "will always tell [employers] that we recommend greater disclosure in the marketplace." In addition to helping employers strike their own deals with PBMs, some of the large benefits consultants operate their own drug coalitions — bringing multiple employer clients under the same umbrella, hoping to get a better deal with the big PBMs. But some experts question whether those arrangements actually benefit employers, Bob reports. What we're hearing: "Most of these PBM coalitions that are sponsored by consulting brokerages are just crap," a source who has worked on pharmacy benefits for more than 20 years told Bob. "They never validate" how they save money, said the person, who asked not to be named to protect relationships. Willis Towers Watson says its drug purchasing organization allows employers to "save 25% or more than their current contract," but didn't offer context behind that number. Benefits experts say employers often have no idea if the savings are true. "The contracts are basically no different from what an individual company can get from a PBM, which means that all the individual company is doing is adding a layer of additional fees from the coalition," says Linda Cahn, an independent consultant who has reviewed coalition PBM contracts. Congress yesterday sent a funding bill for the Department of Health and Human Services to President Trump's desk — the first time in years it hasn’t had to roll that bill into a much larger package in order to get it across the finish line. How it happened: Leadership in both chambers committed early on to passing appropriations bills through regular order this year. My colleague Caitlin Owens reports that a few strategic decisions helped clear a path for the HHS bill — usually the most difficult one. The bill doesn't provide any new funding for the ACA, but also didn't cut any — a status quo Democrats could live with. Democrats also say Republicans wanted to avoid a government shutdown right before the midterm elections. 4. 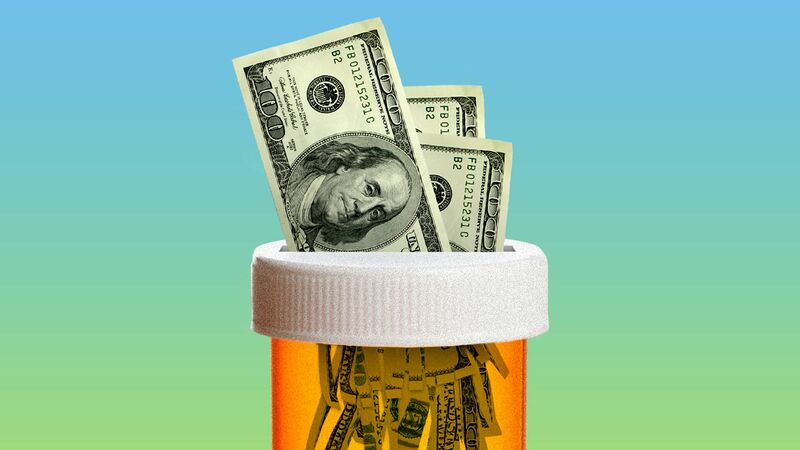 Azar to knock "Medicare for All"
We reported Tuesday on a study that said the median cost of key clinical trials is less than 1% of the average total cost of developing a new drug. However, that study didn’t include some important context — namely, the cost of working on drugs that never make it to market. "The study ignores the majority of costs related to the research and development (R&D) of a new medicine...suggesting a narrow view of the R&D process and risk companies face at the outset of an uncertain project." “More fundamentally, the study excludes the significant cost associated with unsuccessful drug candidates and trials … Less than 12 percent of medicines entering a phase one clinical trial will ultimately be approved for use by patients." Yes, but: Drug companies' profits are large, and growing. Among the 99 largest publicly traded health care companies last year, pharmaceutical companies collected 60% of the profits but only 22% of the revenue. Development costs also don't explain the controversial price hikes of old drugs. Last year's flu virus killed an estimated 80,000 Americans, CDC Director Robert Redfield told AP yesterday. That makes last year the deadliest flu season in roughly 40 years. Last year's strain of influenza was especially virulent, on top of which the flu vaccine didn't work as well as it usually does. Doctors and scientists knew both of those things at the time, but still didn't expect a death toll as high as 80,000. What's next: It's still too early to know precisely what to expect from this flu season, "but we’re seeing more encouraging signs than we were early last year," CDC flu expert Daniel Jernigan told AP.